The Seventeen Days of The Name begins with the Feast of St. Mary Magdalene (July 22) who was the first to witness the Resurrection. 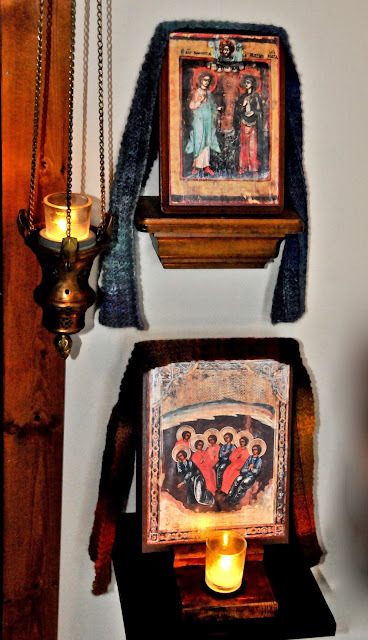 From here we proceed to the Feast of the Seven Sleepers of Ephesus (July 27)*, these six days compose “The Pilgrimage of the Seven Sleepers” where we pray the Seven Redemptive Names of God. Eleven days further delivers us into the second day of “The Rosary Novena for Peace” (August 6 -14). These first two days that the seventeen brings us to are feasts that give us the eighth and ninth Names of God, i.e., August 6, The Feast of the Transfiguration giving us the all encompassing Name, “I AM” and August 7th, the Feast of the Holy Name of Jesus, the Incarnate Salvific ninth Name of God. Just as the Seven Sleepers waited to be awakened (resurrected) into a new world and life, so the Seven Redemptive Names of God lie in the cave of our hearts (Mt. 6:6) waiting to be resurrected into our lives, our decisions, our responses and directions we take. The Seventeen Days of the Name as with the Seven Sleepers is the work of representing eternity in time and perceiving in time eternity. For this work to be realized in our lives we must survive the impact of the world upon our resurrection which is everyday present. Here the Cave has a distinct role in religion and society via initiation through withdrawal (Mt. 6:6) into an environment of internal isolation with God alone as a rite of seclusion as well as resurrection. Therefore, due to this seclusion, a “new” kind of awareness and knowledge of God’s intentions for humanity with regards to the resurrection can enter we who are represented by the seven sleepers. Sprinkle your face with Holy Water seven times and share Scriptures on waking up, being awake, etc. Make Seven Offerings of yourself. Visit a Cave and pray the Names of God. Light seven votive candles and make reparation for the misuse of God’s Holy Name. An Abrahamic meal of lamb and couscous (Gen. 18:8) can be served on the Feast Day of the Seven Sleepers - 27th of July or as a celebratory end to the 17 days of The Name - August 7th. I cannot touch (Mt. 13:45-46). Naive, I am made wise. The Seven Sleepers know this Love. Of their mountain (Mt. Celion). It is not about how we were, but about us as we are, a resurrected people now. It is about Malcius who, as us, was awakened in the Cave and walked out into Ephesus with the old coins that showed the world in turmoil. May we be good stewards of these nine most Holy Coins. * In 2013, St. Simeon Skete embraced the Western date of July 27 as the celebration day of the Seven Sleepers. This links together the Feast Day of St. Mary Magdalene, July 22, composing the 6 days of the Pilgrimage of the Seven Sleepers. Yesterday, July 8th; we met for the Rosary Reparation Retreat at St. Pachomius House; one of the Nazareth House Apostolate, St Simeon Skete Field Houses located in Louisville, Kentucky. 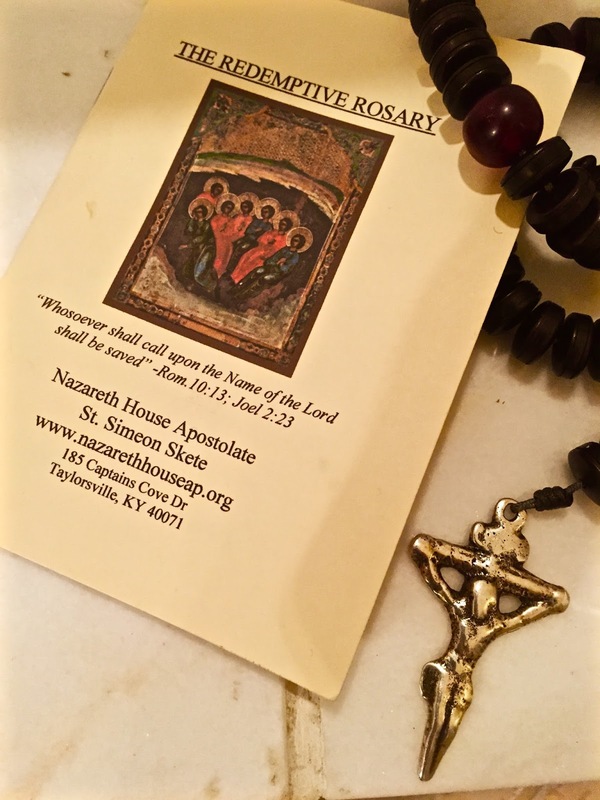 Seraphim has been prayerfully developing the Reparation Rosary since the 1970’s and on July 8, 2015 it was officially inaugurated as the 3rd and Final Strand of the Prayer Rope of St. Simeon Skete. Definition of Reparation: fix, repair and restore. -Hence, making reparation for the blasphemies, outrages and crimes committed against our Lord God within and through the Church and the world. There is much work to be done. 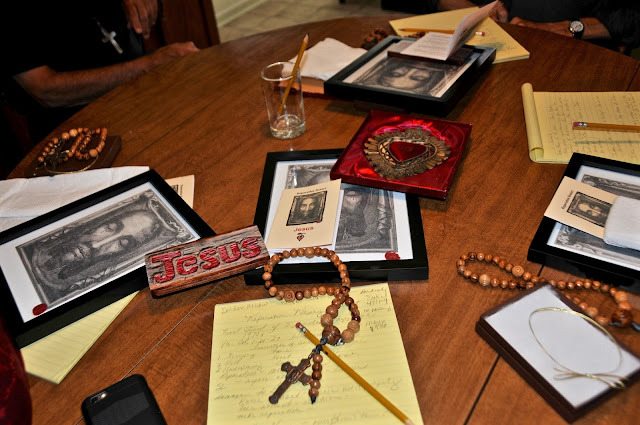 We launched the Reparation Rosary by first praying it and then discussing what it means and how it is to be used. Seraphim talked about when he first went to Sierra Leone, it was to make repairs for the violence. Repairing violence with prayer and love. From the war stemmed hunger, repair hunger by giving someone some food. 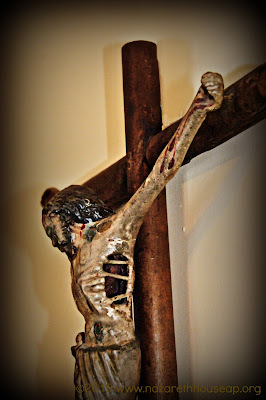 Seraphim carefully reminded us that this rosary is not a revengeful tool to get back at those that have done wrong but that the driving motivation is to repair what has been done wrong in the eyes of God, i.e. If God’s Name is misused, make repairs by praising His Name and using it properly. 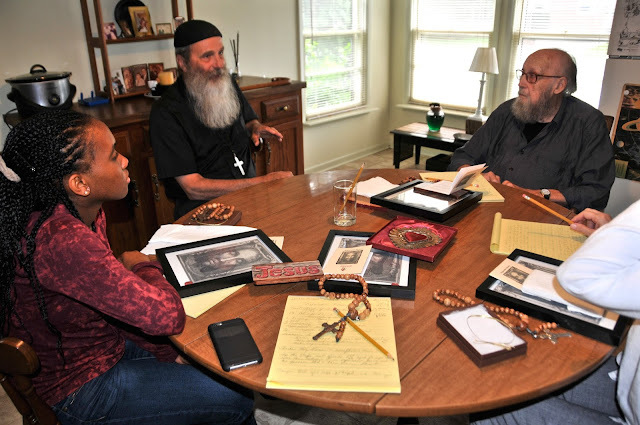 This Reparation Rosary is not about reprisal but hopes to stop the offense before there is a need for reparation. Our drive and motivation is that there are no offenses. Bartimaeus was blind and wanted to see. He called out the Most Holy Name of Jesus and was by Him, who he called, able to see. (Mk. 10:46-52). Veronica - The Prayer of Reparation is the Veil of Veronica. Note: Tradition states that Veronica and the woman healed by touching the hem of Jesus’ garment are the same woman (Mk. 5:24 –34). “The Prayer of Reparation seeks to make whole what is fragmented by putting love where there is none, by gazing with reverence upon Him who men disdain, i.e. “The one from whom men hide their faces” -Isa. 53:3. Abortion is an outrageous blasphemy against the Holy Face of Jesus because it prevents a child’s face from seeing another human face (Ex.20:13; 1Cor. 8:12; Mk. 9:42; Mt. 25:40). It also is an offense against the Most Sacred Name of Jesus because abortion prevents putting a face to a name. Putting a face to a name has great effect. When the soldiers came to the olive grove in search of Jesus, he met them asking: “Who are you looking for?” and they replied “Jesus of Nazareth” and Jesus responded “Iam he”. When Jesus said, “Iam he,” they drew back and fell to the ground. (John 18:3-6). 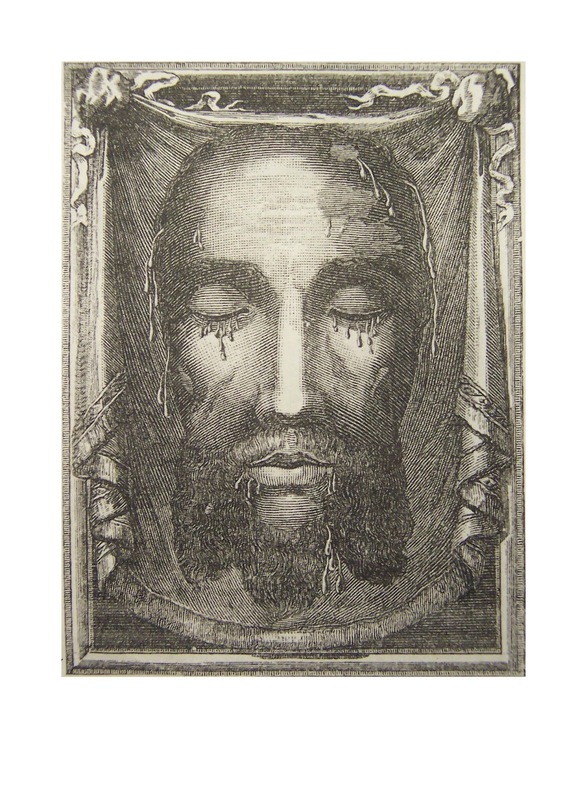 satan and his co-operatives want to keep separated the Most Holy Name of Jesus from His Holy Face. But when Jesus was named satan was disarmed! Note well, the Face of Jesus is intended to change the face of the earth (Lk.1:31: 2:21; Phil.2:9-11). " "To be one who makes repairs is to give our Lord what others deny him. 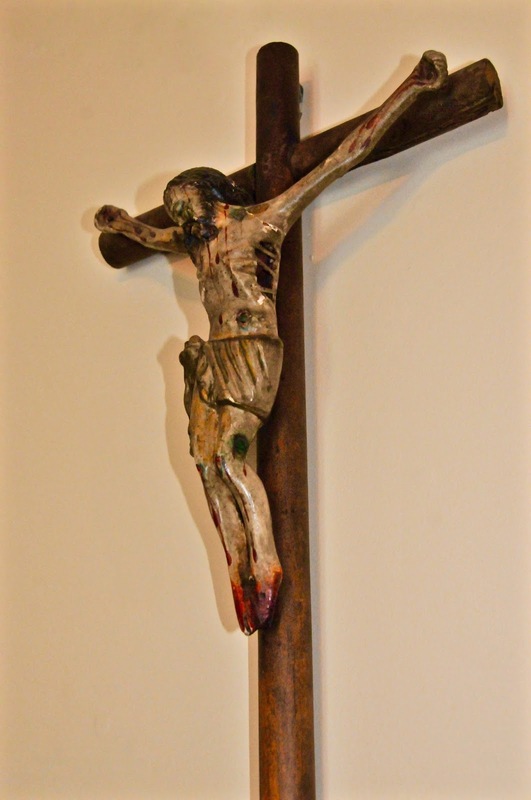 Just recently I was told of a television show that featured various people urinating on the Crucifix of our Lord. Upon hearing this I immediately went to the prayer chapel and placed eleven crucifixes on the altar, lit a candle that I intend to keep burning for 40 days and then offered incense in a deep spirit of reparation. Our Lord said “I thirst” (Jn.19:28). This thirst continues unquenched because it is a thirst for souls, faith, hope, love, thanksgiving, petition and adoration. Our Lord’s thirst will continue until the end of time but so will the call to reparation continue among and in his people." "The Face of Jesus, the Name of Jesus and now the Heart of Jesus seen in his Name and of his Face: It wasn’t until the seventeenth century that the organ of the Heart with its crown of thorns and flame of love began to appear. 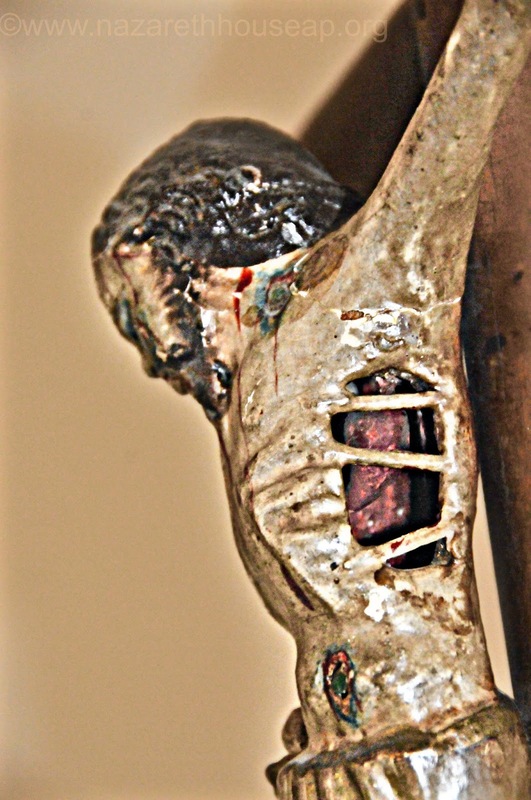 The more ancient images of the Sacred Heart was that of the wound itself in the side of our Lord’s body. The open Wound was in itself an invitation to press beyond it, to cross its threshold, to make one’s dwelling in the inner sanctuary of the Sacred Heart but the Heart remained hidden. We must be careful in taking the Heart of Jesus and enthroning it by itself, in doing so we run the risk of taking the Heart without the Wound. One must be wounded to embrace His woundedness to get to His Heart. 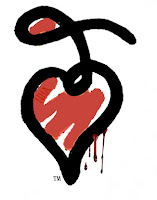 The Prophet Joel says “wound your hearts” - Joel 2:13. As you make reparations before image of the Sacred Heart keep in mind the wound in His side (John 19:34; 20:20; 1John 5:6,8). Hence the putting of “a” Face to “a” Name leads to the Wound which leads to the Heart. "